Mallorca was our another attempt to combine the holiday and Mike training. This time it was easy as we went with the group of friends and everyone was happy - Mike could spend entire day cycling where I had a company to do a sightseeing. Mallorca is the largest of the Balearic Islands belonging to Spain. In summer it's full of tourist but there is no surprise, the views are really spectacular. Below the view from the trip to Cap de Formentor lighthouse near Port de Pollensa. The first day we started from visiting the market in Pollensa and stocking up on delicious spanish jamon The main attraction of Pollensa are the cypress tree lined Calvari steps that lead to the Calvari church. It is famous for ancient wooden cross and the magnificent view on Puerto Pollensa Bay. Monastery Lluc was founded in the 1200´s. It's built in a secluded place in the mountains and it is visited by many Christian pilgrims who come to see the dark Madonna. It's been built on the spot where the black Madonna appeared to the shepherd. We were extremely surprise to meet Mike there, he set off at the time as we in the car and managed to get there just after us. The Dragon Caves are the biggest in Mallorca. The tour includes 15min classical music concert near the lake inside. 10 miles south from the caves there are a beautiful views from San Salvador Monastery, located on a hilltop in Felanitx. It's a Gothic masterpiece. 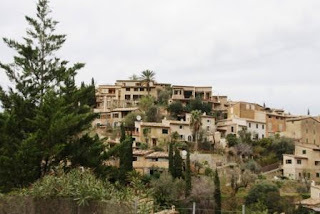 The area of Soller and Valldemossa are the most spectacular of the entire Mallorca. From Soller there is an old train to Port de Soller (photo below) or to Palma passing through the orange orchards. Deia is a small village, located up in the mountain which is popular with the artists. Being at the top we managed to spot Mike passing on the descend to Valldemossa (he was too quick for a photo but there is no doubt that it was Mike). Valldemossa is my favourite place, despite so many souvenir shops it still managed to keep the atmosphere. It become quite famous after the composer Frederic Chopin spent winter 1838-39 here with the author George Sand. The last day we spent in Alcudia - picturesque town surrounded by the city walls. In Alcudia you can see the only roman theatre still preserved on the island. We had a lovely time in Mallorca - Mike cycled 360 miles, we did 450 miles by car so not bad for 5 days. The extra attraction was Mallorca Challenge that was happening at the same time - 5 stage cycling tour around the Mallorca.